These folk, hailing from Holland, have had a deep love of cheese for over one hundred years, ever since a man named Willem Bos made cheese tools for the dairy farmers of Gouda. And yes, that’s Gouda as in Gouda cheese! A hundred years on, and Boska are still making tools for those who love to explore the world of cheeses (however, there’s no room for plastic, pre-sliced cheese in Boska’s world, no sir). Their Life collection is all about enjoying food with friends, with a fun twist on traditional serving methods – and few things are as fun as a good old cheese fondue! Grate some cheese in to one of these fondue pots, light up the burner underneath, and enjoy the cheesy sensation! There’s even a bunch of forks for you and your friends, so that you can host a good old-fashioned fondue night. Fondue pot and base made from ceramic. Stainless steel fondue forks, frame and burner. Can also be used with chocolate! 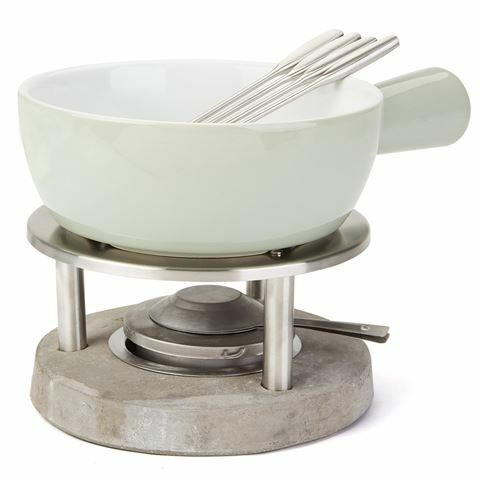 1 Litre Fondue Pot – 20 x 8cm (excluding handle). Frame and Base – 19 x 11cm. 4 x Fondue Forks – 22cm.